Thank you for sending me copies of your books (they arrived in today’s mail), and thank you even more for writing “with admiration for your truth telling” inside the cover flap of one. I am humbled, because I waited my whole life to realize today I had already met you. In 1971 I was ten years old, living in a small town in Ohio. The Vietnam War was a part of our town’s life, same as the Fruehauf tractor-trailer plant with its 100% union workforce, the A&P and the Pledge of Allegiance. Nobody in my house went to war, but neighbors had blue and gold stars in their windows and I remember one teacher at school, the one with the longer hair and the mustache, talking about Vietnam. It meant little to me, involved with sports and oncoming puberty, but I remember my mom bringing home from the supermarket a newsprint quickie paperback edition of the Pentagon Papers. She knew of politics and Vietnam maybe even less than I did, but the Papers were all over the news, the Lady Gaga of their day, and it seemed the thing to do to spend the $1.95. My Dad flipped through the book, pronounced it garbage and when I tried to make sense of the names and foreign places it made no impact on me. A lot of people inside the government had read those same Papers and understood their content, but only you decided that instead of simply going along with the lies, or privately using your new knowledge to fuel self-eating cynicism, you would try to persuade US Senators Fulbright and McGovern to release the papers on the Senate floor. When they did not have the courage, even as they knew the lies continued to kill Americans they represented, you brought the Papers to the New York Times. The Times then echoed with the courage of great journalists and published the Papers, fought off the Nixon Administration (New York Times v. The United States) by calling to the First Amendment and brought the truth about lies to America. That’s when my mom bought a copy of the Papers at the A&P. You were considered an enemy of the United States because when you encountered something inside of government so egregious, so fundamentally wrong, that you risked your own freedom to make it public. You almost went to jail, fighting off charges under the same draconian Espionage Act that Obama uses today to silence others who stand in your shadow. In 2009 I volunteered to serve in Iraq for my employer of some 23 years, the Department of State. While I was there I saw such waste in our so-called reconstruction program, such lies put out by two administrations about what we were (not) doing in Iraq, that it seemed to me that the only thing I could do—had to do—was tell people about what I saw. In my years of government service, I experienced my share of dissonance when it came to what was said in public and what the government did behind the public’s back. In most cases, the gap was filled only with scared little men and women, and what was left unsaid just hid their flaws. What I saw in Iraq was different. There, the space between what we were doing (the waste), and what we were saying (the endless chant of success) was filled with numb soldiers and devastated Iraqis, not nerveless bureaucrats. It wasn’t Vietnam in scale or impact, but it was again young Americans risking their lives, believing for something greater than themselves, when instead it was just another lie. Another war started and ended on lies, while again our government worked to keep the truth from the people. I am unsure what I accomplished with my own book, absent losing my job with the State Department for telling a truth that embarrassed them. So be it; most people at State will never understand the choice of conscience over career, the root of most of State’s problems. There are higher goals than obedience. But Dan, what you accomplished was this. When I faced a crisis of conscience, to tell what I knew because it needed to be told, coming to realize I was risking at the least my job if not jail, I remembered that newsprint copy of the Papers from 1971 you risked the same and more to release. I took my decision in the face of the Obama administration having already charged more people under the Espionage Act for alleged mishandling of classified information than all past presidencies combined, but more importantly, I took my decision in the face of your example. Thank you for the books you sent me Dan, and for the sentiments you expressed toward me inside them. Thank you for your courage so that when I needed it, I had an example to assess myself against other than the limp men and women working now for a Department of State too scared of the truth to rise to claim even a whisper of the word courage for themselves. On April 25 a number of people will gather in Washington DC for this year’s Ridenhour Prize, which recognizes patriots who choose acts of truth-telling that protect the public interest, promote social justice or illuminate a more just vision of society. I am proud to have been nominated. One of this year’s winners is Congressman John Lewis, whose life working for social justice started when he walked alongside Dr. King. Another awardee this year is Lieutenant Colonel Danny Davis, a soldier whose leaked documents on the Afghan War revealed the same rotten lies at its heart that we saw in our previous wars. 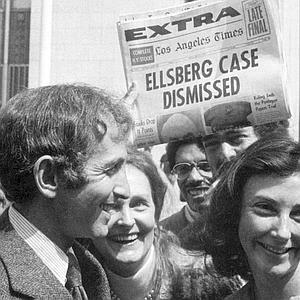 Daniel Ellsberg was the first person awarded the Ridenhour, his award simply for Courage.